Aug. 26 may not be much of a fight day, but as far as spectacles go it may never be topped. Floyd Mayweather Jr. is more in love with himself than any man has ever been, and he lives to promote himself. Conor McGregor can outtalk anyone and is fearless and cocky. Bring them together, throw in a few hundred million dollars, and set it in Las Vegas for good measure, and you are going to have a fight week like we have rarely seen. We can talk about how the actual fight might turn out closer to the event. BetOnline has set some interesting prop bets leading up to the fight, though, and this is a good time to take a look at them. At least one could be worth a bet if you are desperate for some summer action. Will the fight take place Aug. 26 - "No" +400: There has been a trend lately for top UFC fighters to miss their events due to injury. There is so much more on the line here than a typical UFC match, though, so you have to imagine that these guys would have to lose an arm to not go for this one. It also helps that the chances for injury are likely less when training for boxing than for MMA. As much as I would love to take a shot at the no at a big price like this, it just seems like it would be too much of a gamble. Time to look elsewhere. Most Tweets in August - Mayweather +130, McGregor -160: The easiest way to attack this one is to learn from history. June isn't over yet as I write this, but let's look at what happened in April and May. McGregor tweeted 49 times in April. In May he dropped to 21, but his son was born at the beginning of the month, so that likely distracted him. 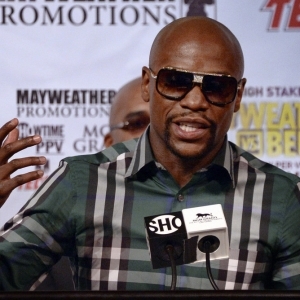 Mayweather tweeted just six times in April and jumped up to 20 times in May. Mayweather typically tweets only when he is promoting something or showing off how much money he has. McGregor is more conversational and engages more with his fans. This one seems clear - McGregor is a deserving champ, and the price is likely fair. McGregor tweeted an impressive 42 times in the week before his last fight, so we don't need to worry that he'll slow down in August, either. Total combined Tweets in August - "over/under" 40.5: The over is free money here. McGregor is capable of getting to this money himself in a month, and the fight isn't until the 26th, so he will have plenty of time. He ramps up his online action close to a fight, and there is no bigger fight than this, so he should be vocal. Mayweather is a born promoter, and he will be in top form online as well. It seems highly unlikely that they will go anything but over. The over is just -115, which is a major bargain. Physical confrontation at press conference? - Yes +260, No -350: The no is the favorite here for good reason. Both of these guys will want to give the impression that they are angry, but neither will want to do anything to risk themselves for the fight - they are too smart for that. If the bet were for endless bravado and shows of rampant ego then the yes would be a lock, but I just don't see them coming to blows. Will there be a rematch - Yes +500, No -800: I would love to bet the yes at this price, but I just don't see how I can. How would a rematch come about? If Mayweather wins then he has no incentive to fight again. He'll be 50-0, he'll have done what he was supposed to do, and there won't be any upside for him to try again. It's tough enough to understand what's in it for him besides money the first time around, never mind a rematch. If he wins easily then the appetite for a rematch from the public will be diminished, and if he wins a narrow result then he won't want to fight again when he's older and McGregor is more experienced. And if McGregor stuns the world and wins then what would his incentive be to try again? He knows how much of an underdog he is and that his brand would be stronger if he wins and moves on to the next impossible challenge than if he fights twice and splits the results. The money for a rematch would be ridiculous, but neither of these guys are desperate enough to make a bad decision, and both will have other options. The no is, as the odds suggest, the clear choice - though far from a value pick.